Every year, half of the 610,000 heart attack deaths in the United States are due to a lack of prompt medical attention. Currently, most technologies fail to fix the problem, as they simply take too long to be able to detect a heart attack in time. Either the biomarkers they track spike in delayed reactions or the device is not capable of autonomously monitoring the body and reading signs before physical symptoms evolve. 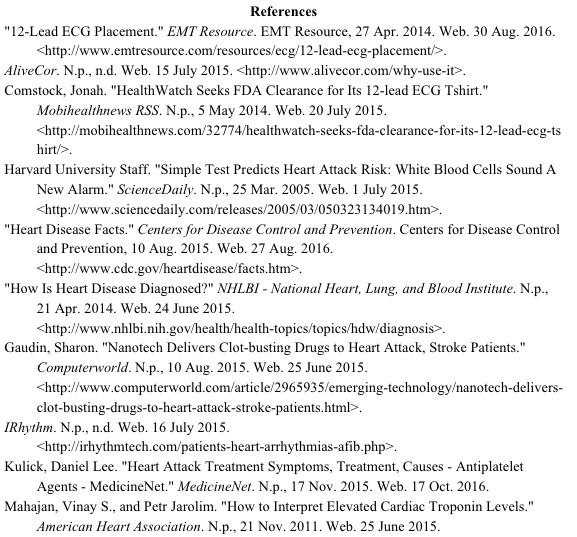 A burst of companies have integrated the hospital-grade standard of electrocardiography into wearable devices in order to overcome these hurdles. However, this same process has overpopulated this field and squeezed out room for further innovation. With the goal to adapt the success of this wearables trend in the direction of a more novel pursuit, we propose an echocardiographic patch worn over the heart. 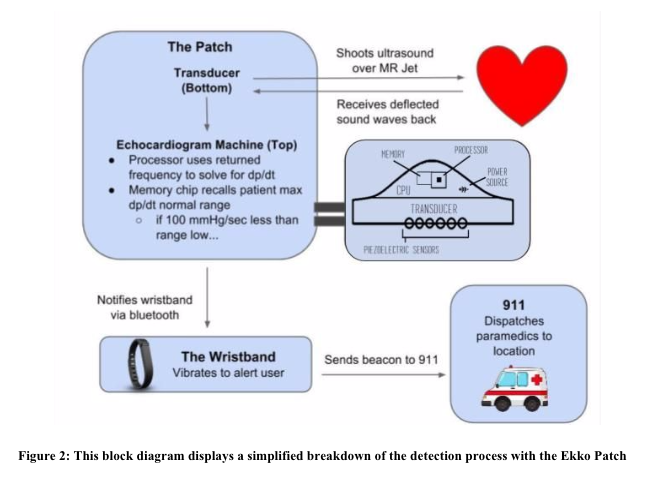 Our patch detects if a myocardial infarction are occurring based on periodical dp/dt readings of the mitral regurgitation jet and connects with a wristband via bluetooth to alert the user and medical authorities in the case of danger. Approximately $600, it would provide the benefits of more speed, accuracy, and awareness than current ECGs for only a small price increase, thus making it the superior market option for consumers. Heart attacks are the leading cause of death in the United States, claiming 610,000 victims a year. On the surface level, it is easy to blame the treatment methodologies in place. However, the Centers for Disease Control report that 47% of these deaths occur outside a hospital (“Heart Disease Facts”, 2015). The problem thus lies not in the treatment of a heart attack but in the detection of it. In the summer of 2015, we worked to design a product which could detect heart attacks at their earliest stage and alert both users and medical authorities if any abnormalities were to be detected. solution to this problem must be able to autonomously detect a heart attack within these first twenty minutes and must constantly be with the user to track any and all abnormalities in real time. In the status quo, detection technologies are largely located in hospitals, but this initial research reveals that the answer lies in the form of a smaller and more accessible consumer device rather than in traditional medical equipment. The next step was to design a set of need specifications that the product would have to meet in order to be a success, both in terms of its performance and appeal to consumers. These specifications are listed in Table 1. The “five A’s” were set through an analysis of relative data. A hospital-grade 12-lead electrocardiogram machine, the gold standard of detection technology, is able to provide a definitive diagnosis 90% of the time, so an improvement should ideally be able to match if not exceed this accuracy (“How Is Heart Disease Diagnosed?”, 2014). Similarly, an electrocardiogram test takes five minutes to complete, so through autonomous administration, it would be viable for a consumer device to conduct its own test within less than twenty minutes of the start of a heart attack (acceleration) (“How is Heart Disease Diagnosed?”, 2014). The performance-based aspects of accuracy and acceleration in a device would be most important to a successful detection process, so any design that did not meet the baseline specifications in these two “As” would be inadequate. In the case that a heart attack was detected, the device would then need to be alert and communicate the results with both the user and paramedics to complete a successful detection process. Of course, as a consumer device, it would have to be relatively affordable, so it should be priced at less than $1000 based on current models on the market. Last of all, the comfort and style of the product was crucial to appeal to the customer. These “five As” thus served as a set of quantitative parameters to test which technologies and resultant product designs would have the desired specifications. The protein troponin is found in the heart muscle and is released when the muscle takes damage. Thus, during a heart attack, troponin levels exceed the 99th percentile of values (Mahajan and Jarolim, 2011). Two potential product designs were formulated to track changes in this indicator. Inspired by nanotechnology research done by the Vascular Biotechnology Institute, the first design was a pill which would break down into nanoparticles on consumption and collectively report data on troponin levels to a metal wristwatch through magnetic attraction. (“Nanotech Delivers Clot-busting Drugs to Heart Attack, Stroke Patients”, 2015). The second design played with the idea of a blood test self-administered by the patient (“Troponin Test: MedlinePlus Medical Encyclopedia”, 2016). However, it became apparent that both products would be expensive (fail affordability) and had the fundamental flaw of not being able to autonomously track troponin levels (fail alertness). Therefore, none of these products seemed to be ideal. A bit more research revealed that any troponin-based solution could not possibly meet the baseline parameters, as troponin levels themselves spike anywhere from two to six hours after the initial onset of a heart attack (fail acceleration). A test used to track them would take even longer, by which time it would be far too late to save the patient. As the body’s defense mechanism, white blood cells are called into action to displace the plaque from the blocked coronary artery during a heart attack (Harvard University Staff, 2005) This change from the norm spawned the concept of a surgically implanted chip that could detect elevated levels of white blood cells in the heart. Aside from the fact that chip would be too invasive, the biomarker it tracked was once again unsuitable. White blood cells also spike in a delayed reaction, once again falling short of our needs. transverse) and thus the accuracy of the diagnosis is ensured (“12-Lead ECG Placement”, 2014). Now, an interview with Dr. Jeffrey West, a practicing cardiologist for twenty years, revealed that most existing solutions replicating this model are fast, cheap, and accessible but sacrifice much of the accuracy of the 12-lead ECG for the sake of these qualities. AliveCor’s Kardia incorporates a 1-lead ECG into an iPhone case to provide readings on electrical impulses in the heart at the touch of a finger (AliveCor, 2016). However, Kardia’s single lead can read data from only one plane of motion and thus has the scope to miss abnormalities in any one of its many blind spots. This is not to mention that Kardia cannot autonomously administer the test. The patient would only check with Kardia if he/she felt any physical symptoms which, as stated before, evolve too late in the process. It thus loses out on not only accuracy but speed, failing both performance-based need specifications listed. iRhythm’s Zio Patch ($299) uses a 3-lead ECG to track electrical activity over a two-week period and thus has higher accuracy, but has little to no ability to detect a heart attack as the data can only be analyzed retrospectively by a physician (iRhythm, 2016). HealthWatch’s ECG Shirt ($199) is the best solution in the market as of now. It integrates electronic leads into the fabric of an undershirt and thus ideally has the accuracy and speed of a 12-lead ECG (Comstock, 2014). An assessment of the competition spawned the product design for the ECG Waistband ($149), a wrap-around wearable which would autonomously scan the heart muscle every half an hour and report and abnormalities to medical authorities. However, this design barely offered an improvement on the ECG Shirt, a device already in the market. qualitative results into quantitative, machine-readable data, it could potentially yield a viable solution. This road led to the blueprint of a continuous wave Doppler ultrasound patch which would not only advance the heart attack detection market, but also manage to match if not exceed the functionality of the ECG Waistband. the low in the normal range, then the patient is at danger. In this case, the machine connects to a wristband via Bluetooth, which then vibrates vigorously to alert the user and autonomously sends a report of the patient’s location to paramedics. This lengthy process is actually compressed into a five-minute window, meaning that the patch provides more speed, accuracy, awareness and portability than current electrocardiograms for only a small price increase. There was neither time nor resources to develop a functional prototype, but a couple models were made to represent the appearance of the Ekko Patch. The first prototype is a plastic 4x3x1 dome intended to display the internal components of the patch. At the top, a CPU chip, memory chip, bluetooth chip, and battery pack are placed side by side to represent the theoretical “machine”. At the bottom, the transducer is modeled with film with piezoelectric sensors glued on to it. The second prototype is constructed from a silicone mold and focuses more on the external design of the proposed concept. This patch has the exact same dimensions as the plastic prototype, but is made from a much softer, flexible material which feels more natural on bare skin to ensure maximum comfort. The final product would ideally have the internal components of the first prototype encased in the external design and style of the second. The wristband is represented by an improvised Pivotal Tracker device, a $15 fitness tracker similar to the Fitbit. In the final apparatus, the Pivotal Tracker’s features would be replaced with far more simplistic ones. It would need to have a Bluetooth chip to communicate with the patch, vibrational motors to alert the user if the received dp/dt is below a certain value, and geopositioning technology to send a beacon of the patient’s location to medical authorities if needed. The patch and the wristwatch would work with each other to complete their respective steps in the detection process. A survey of 32 adult and teenagers was conducted to assess if the Ekko Patch is well-suited to consumers. On a scale from 1-5, the overall feeling towards the product concept was on average a 4.03. Similarly, the size and material aspects of the patch received 3.52 and 4.13 respectively. The survey indicated that the product could hypothetically do well in the market, as the sample gave a score of 4.58 as to how likely they would be to buy the product if they were at high risk of a heart attack. that arise. Along with perfecting the performance-based aspects, developers would ideally research methods to compress the internal circuitry into a smaller and more stylish patch, as that was one area of improvement from the survey. This process would be repeated through as many iterations as needed to create a product ready for the market. ultrasound technology, the Ekko Patch would, in the long-term, inspire innovation in a field that has been largely overlooked. This would mean more options in the market for heart attack patients and make it possible to save more lives than ever before. Heart disease has been the leading cause of death in the United States for too long. It is time to knock it off its pedestal.